Apparently doggie socialization is a big part of my development. I just love to run around and play. Mom took me to the Trump National Golf Course which has a beach just below it where dogs can run free of leashes and play with each other. One of her friends organized the meeting of the dogs. She carried me down the hill because walking downhill is not good for my little hips, but by the time we got to the bottom I was wiggling all over the place and I was READY TO PLAY! At first it was just me and Bijou, and we were friendly with each other, but I don’t think she wanted to play much. 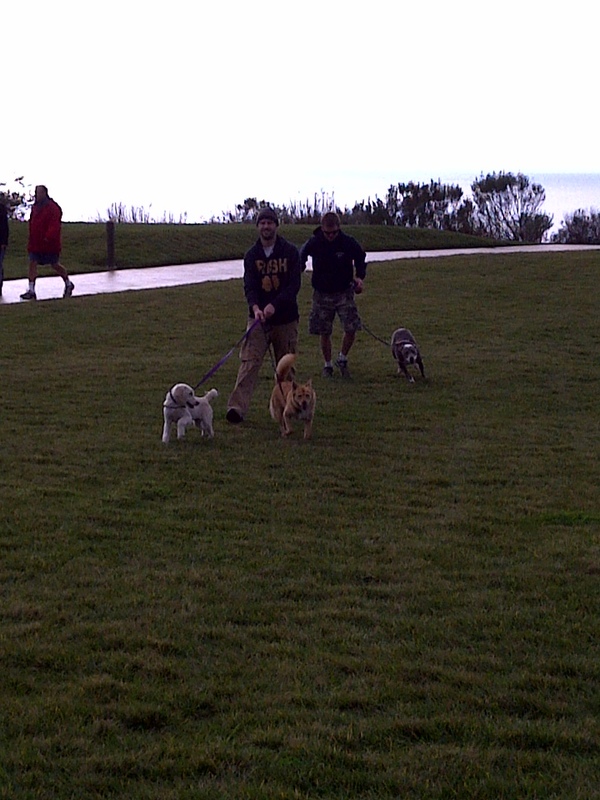 Then I found a bunch of people who wanted to play and I ran around like crazy while they all laughed at me. A little while later Moxie showed up and she was a little intimidating at first, but after a while we became friends and started playing together. I first made these friends and started digging all over the place. I even got buried once or twice because I was so wrapped up in my digging. 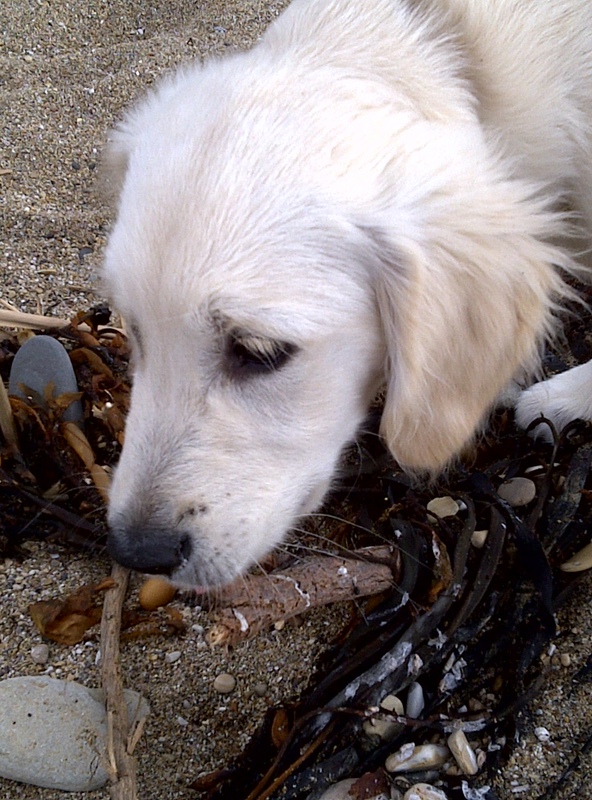 Then I ran around trying to eat all the seaweed I could find. (Callie taught me that) …. 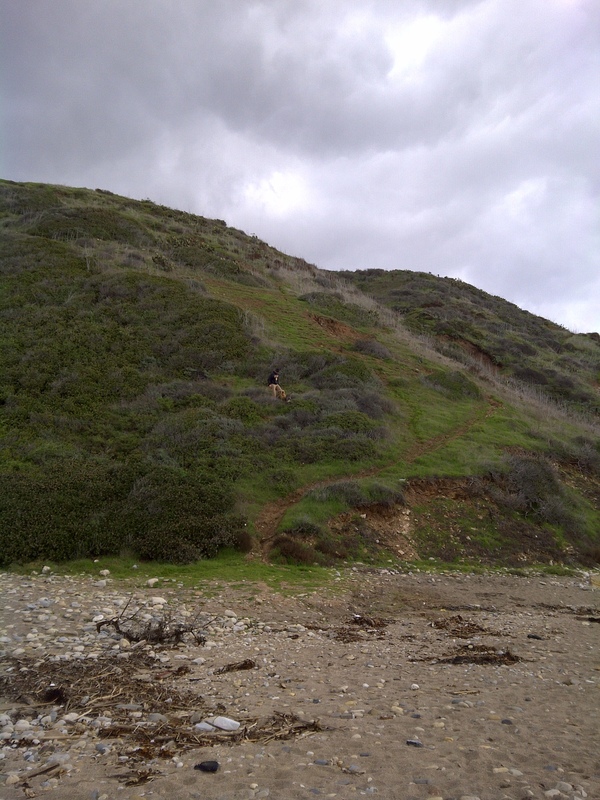 and my mom kept chasing me telling me uhhh NO, but I kept trying. The other girls ran up here to chase a ball, but I didn’t because I was too worried about laying in my hole. 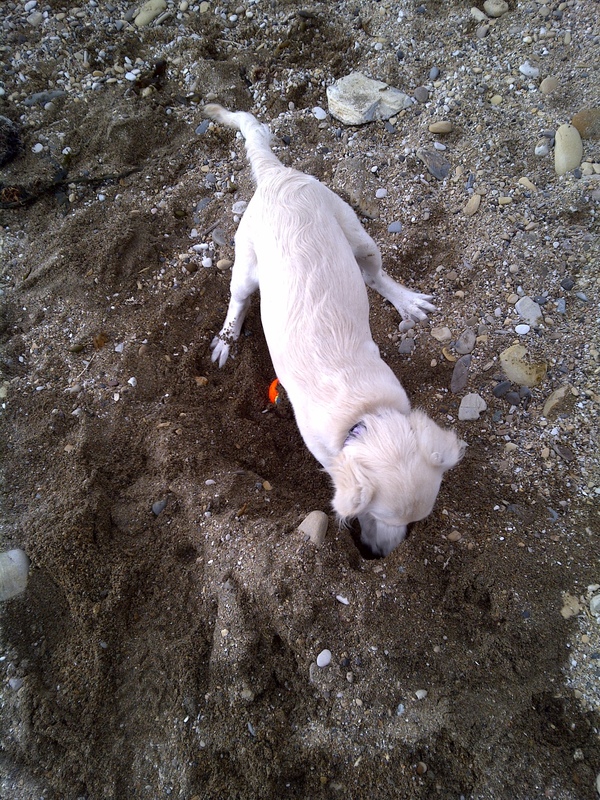 I became a better digger on this trip to the beach and I think mom is glad that I don’t try to dig up the backyard the way I do the sand. 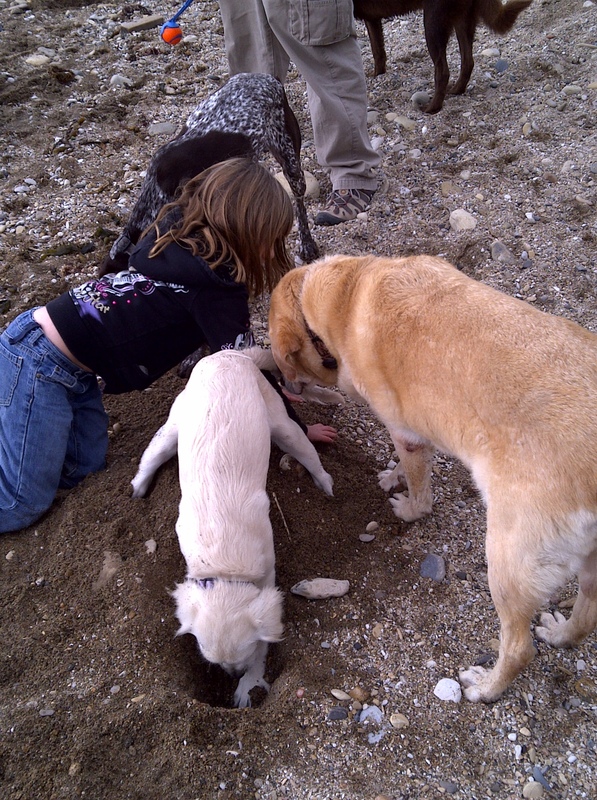 Here is me and Moxie NOT getting the ball that is thrown for us, and instead picking up sticks and seaweed to eat…. I got to play for almost an hour and a half which was really fun. 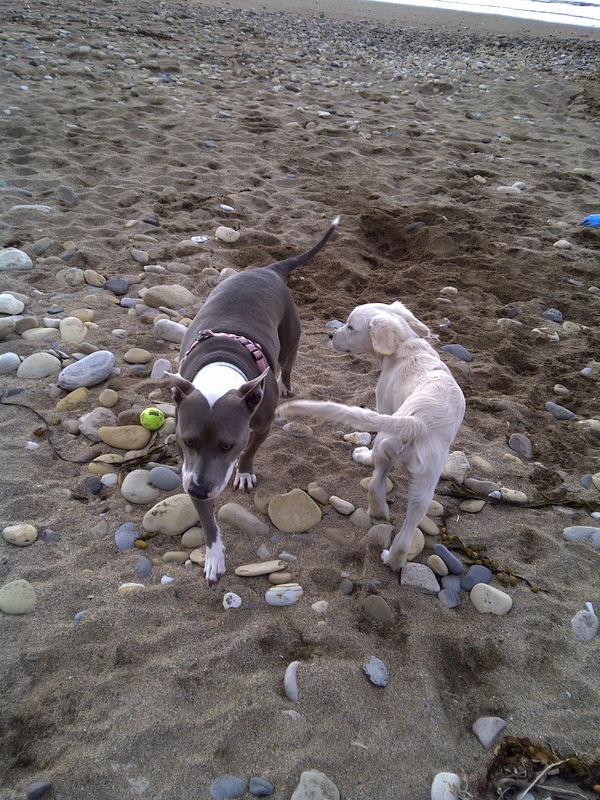 I made friends with most of the other dogs on the beach, even the yappers, and the HUGE dogs. We were all friends. I can’t wait to go back.